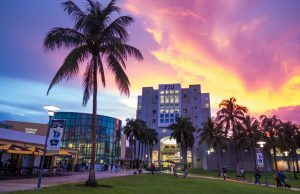 FIU has earned national designation as an Innovation and Economic Prosperity (IEP) University by the Association of Public and Land-grant Universities (APLU) and its Commission on Innovation, Competitiveness, and Economic Prosperity (CICEP). The APLU created the IEP University designation to recognize universities that are at the forefront of economic development, prosperity and innovation. Universities selected for the prestigious designation have committed themselves to talent and workforce development; innovation and technology-based economic development; and social, cultural, and community engagement. The Center for Children and Families (CCF), a world-class clinical research center committed to the advancement of child mental health. CCF is devoted to helping struggling children and families through clinical services, cutting-edge research and training and education. Since joining FIU in 2010, CCF has served more than 7,000 local families, trained more than 6,000 Miami-Dade County Public School teachers and worked with nearly 500 schools to improve classroom experiences for educators and students. The Applied Research Center (ARC) translates research into real-world applications. Through its 20-year partnership with the Department of Energy (DOE), FIU faculty and students have developed, tested and deployed technologies to support environmental cleanup. Nearly 1,000 students have had hands-on training at 11 DOE sites. FIU’s Office of Engagement leads and coordinates the university’s efforts to develop strategic partnerships that support K-12 education, build a strong talent pipeline and strengthen the local job market. Engagement oversees some of FIU’s most important initiatives and region-wide collaborations, such as the Talent Development Network (TDN), Life Sciences South Florida, and municipal partnerships with the City of Miami Beach and Sweetwater. This year, TDN helped place more than 150 students in internships with local companies. StartUP FIU, an initiative with programs to support faculty, students and local entrepreneurs launch new startups, grow early-stage companies and commercialize technology. In its two-year history, StartUP FIU has worked with over 100 teams and created 17 new companies, with an estimated $7.8 million in revenues. FIU is also home to the Wall of Wind, the nation’s only university research facility capable of simulating a Category 5 hurricane. Researchers are advancing understanding of hurricane impacts on buildings and other structures and developing damage mitigation products and techniques. This year, FIU is one of six universities in the nation to be named one of APLU’s IEP universities. For more information on the APLU’s Innovation and Economic Prosperity (IEP) University designation, please click here.